Each year, thousands of rabbits, chicks, and ducklings are purchased in the weeks leading up to Easter with many (80% by some estimates) abandoned a few weeks later. The lucky ones end up in shelters while many others die after being “set free” outside. I support responsible rabbit adoption and urge everyone to make informed, well-planned decisions when adding any new pet to the family. 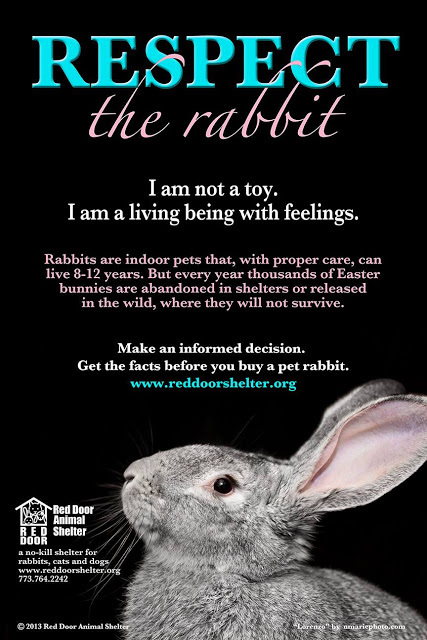 Rabbits are not toys or holiday decorations – they are a living, feeling, long-term commitment. If you are unable or unwilling to provide a lifetime of care, please choose a chocolate bunny instead. Want to learn more about rabbits, check out our bunny basics series here. Next Post Full Moon Training Treats – What’s Not To Love? This is an important message. We think a candy rabbit is much better to give than a real one. We totally agree and we hope everyone chooses wisely. We wish people would THINK! Chocolate rabbits are much easier to maintain for sure. There's never that many rabbits in our shelter though so I wonder if it's a big problem here. A very important message to share. As it is rabbits are the most abused animal in the UK from what I understand, so to buy one simply because it's Easter only to discard them when the novelty wears off in a few days is so sad, not to mention irresponsible. So glad you're helping to inform and educate. We couldn't agree more! And we shared on Facebook to spread the word. Ugh, I could not agree more. Those poor bunnies. It's like people who get puppies for Christmas because they're cute and little, not "realizing" that they grow up and become dogs. Pets of any kind are a commitment and should only be adopted/bought after great consideration and with the intention of loving and caring for them for their entire lives! Nobody should get any animal for any reason other than wanting to share their life with that animal. Be it a dog, a cat, a bunny … There is only ONE legitimate reason to bring an animal into a home. Absolutely! Thank you. Hugs and happy Easter! It is upsetting to know people can purchase an animal for convenience and then "discard" them when they are done. I'll never understand that mentality. Great post to spread awareness. Wonderful and very important message! We could not agree more, and we hope people are listening! Surely it is not so hard for humans to Choose Chocolate? I feel so sorry for rabbits and chicks this weekend. Hopefully, not too many will end up in a shelter or worse because of Easter. Thanks for this informative post. I ca't understand the need to grab a rabbit at Easter. I mean REALLY Don't people realise it will need years of feeding, vet care and companionship? That is such an important message, dear pals. Rabbits, chicks and ducklings are all animals that need love and care. They are not Easter presents! So agree! Rabbits, chicks and ducks are NOT good Easter gifts! Hope you all had a wonderful Easter weekend at your house Ruby with Chocolate bunnies for the Peeps and extra cuddles for all of you! I just read a sad statistic that I hope is wrong, 95% of Easter bunnies (the ones given as gifts on Easter) don't make it through the first year. My sister-in-law has taken in many rabbits over the years that people bought without researching rabbits. A couple were Easter gifts.My son's rabbit is 10 years old and still seems like she is going strong. The numbers are staggering, I had no idea. Hopefully people will smarten up! It's sad how some people view animals as disposable toys. I hope that as awareness like this is spread, that the occurrence of stuff like this dwindles. Thanks for all that you do to support and inform! I hope this post has helped people to make educated decisions this Easter season. Bunnies can be great pets, but they take a lot of work and require dedication and care. It always breaks my heart to see how many are abandoned after an impulse decision for a holiday. Thanks for sharing this! Ugh, that's so sad. I agree, choose chocolate! I would almost choose chocolate over anything. Anything. Thank you for getting these numbers out there! Rabbits make great pets, but you have to be ready for the responsibilities that come with caring for a living creature. It is so sad that so many animals are mistreated every year because someone thought they would make a great novelty gift. This saddens me to no end. I've shared my guilt over how my family cared for our bunny (NOT an Easter present … we got him as a forever pet) because we had so little knowledge of how to. That was in the days of pet stores selling animals and we just bought the introduction rabbit kit the store sold – later finding out that it was entirely inappropriate. I remember getting baby chicks for Easter when I was a child. I honestly don't think people realize these chicks will grow into adults. Luckily, my parents had friends who had a farm and they went to live there. I'd much rather have the chocolate now. Rabbits, kittens, puppies, any animal is a commitment and bringing one into your home should be done with the understanding that they are not disposable and come with responsibility!